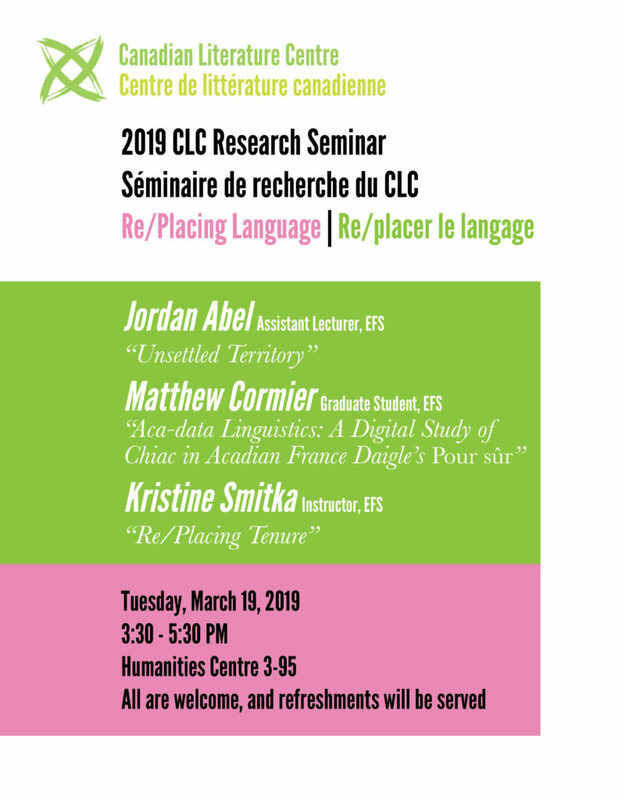 Join us for this year’s CLC Research Seminar, where three EFS scholars will gather to discuss their work in relation to our theme “Re/Placing Language.” Jordan Abel (Assistant Lecturer, EFS), Matthew Cormier (Graduate Student, EFS), and Kristine Smitka (Instructor, EFS) will each deliver a paper on this theme. In this short artist talk, Jordan Abel will discuss his concrete work “Cartography (12)”—a piece that was recently commissioned by the Polygon Gallery in North Vancouver that continues work that started in his second book Un/inhabited (Project Space Press/Talonbooks)—in relation to questions about land, Indigenous knowledges, and the imaginative space of poetry. In studying representations of Acadian identity in France Daigle’s Pour sûr (2011) by using digital methods and visualizations, I must consider how to engage with the novel’s treatment of Chiac, the Acadian, Francophone dialect that includes English and remnants of archaic French. Chiac’s fluidity, in both practicality and definition, makes it difficult to quantify and analyze, begging a question that, historically, troubles digital humanists and linguists alike: data or capta? Data—what is given as fact—and capta—what is taken as fact— in studies complicate the integrity of both linguistic and digital analysis. My talk will chronicle my work through the issue of “data or capta” in attempting to digitize Chiac’s representation in Daigle’s Pour sûr as an integral constituent of Acadie’s cultural fabric. The concept of tenure originated in the twelfth-century, where it was associated with mobility: a scholar’s right to travel throughout the Holy Roman Empire without fear of attack. My talk, “Re/Placing Tenure,” traces the etymological permutations of the word ‘tenure’ from its roots in guild culture, the precursor of modern-day unions, to its purchase within popular culture as a symbol of privileged entrenchment. This shifting term will be placed within the context of current labour conditions in Canadian—publicly-funded—universities, where more and more employees work outside of a tenure-track system. Central to the presentation will be the disambiguation of the terms academic freedom, job security, and tenure. In so doing, this talk aims to address the research seminar’s goal of addressing “language relating to place, space, or location” by opening a conversation regarding the language that frames not only academic work, but also the relational experience of colleagues who are described using different terminology. February 7, 2019	Comments Off on 2019 CLC Poetry Contest! 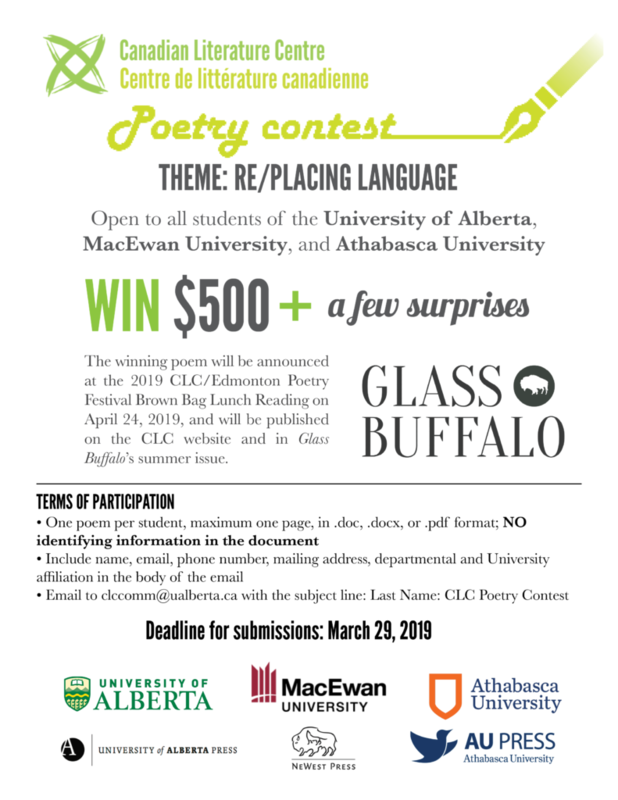 The 2019 CLC Poetry Contest is back and seeking the best poem in French or in English that Alberta students have to offer! This contest is open to all students at any level at the University of Alberta, MacEwan University, and Athabasca University. This year’s winner will be awarded $500, plus books donated by NeWest Press, the University of Alberta Press, and Athabasca University Press. One poem per student, maximum one page, in .doc, .docx, or .pdf format; NO identifying information on the document. Include name, email, phone number, mailing address, departmental and University affiliation in the body of the email. Deadline for submissions: March 29, 2019.